Downed trees and fallen branches still litter Hong Kong nearly two months after Typhoon Mangkhut ripped through the city. The strongest storm to hit Hong Kong since the city began keeping records, Mangkhut left a trail of devastation. Though there was no loss of life, the storm battered the city’s buildings, causing more than $1 billion in insurance claims according to some estimates. But it was the city’s green spaces that incurred the greatest damage. The city government estimates that 54,000 trees were felled during the storm, though experts say the number could be nearly double that figure. Many of those fallen trees have remained on the ground, blocking paths and walkways. It’s an unusual sight in a place that prides itself on urban efficiency. The cleanup after the previous typhoon, Hato in 2017, also one of the most powerful storms ever to hit the city, took just days. 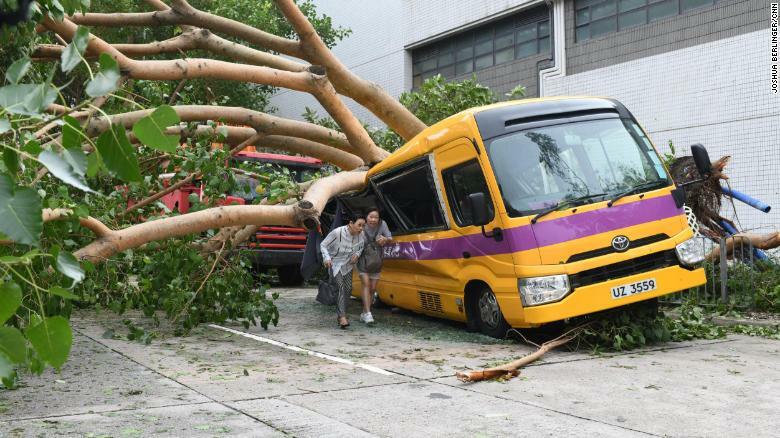 A school bus in Hong Kong’s Heng Fa Chuen is seen after being destroyed by a tree during Typhoon Mangkhut. Jim Chi-yung, a professor at The Education University of Hong Kong and an expert in urban green spaces, estimates that more than 100,000 trees came down in the storm, pointing to the fact that the government numbers only include the ones reported to authorities. “I would describe it as catastrophic in terms of the lost big trees. Over half of our bigger trees in the city are gone,” Jim said. Hong Kong is well known as an urban jungle, with skyscrapers jutting out of the island’s hillside, but the city is surprisingly green and rural. Less than 25% of the land in Hong Kong has been developed. Hiking, cycling, beach trips and boating are some of the most popular weekend activities for residents, expats and tourists. “It will take years and years to get back to how it was,” said Rory Mackay, the founder and owner of Wild Hong Kong, an adventure and eco tour operator in the city. 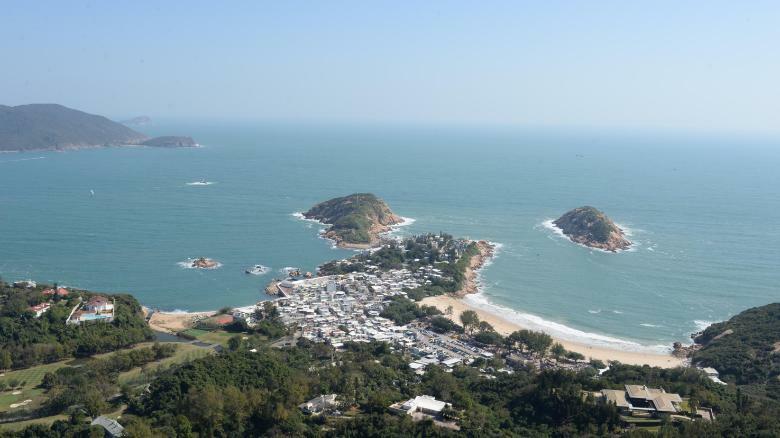 A view of Hong Kong’s Shek O beach from the Dragon Back hiking trail in January 2018. Part of the beach and buildings along the coast were severely damaged in Typhoon Mangkhut. Poor urban planning and the sheer strength of the Typhoon Mangkhut are both to blame for the destruction of so much greenery, experts say. City planners have spent years planting large trees that require plenty of space and proper soil management to grow deep roots to anchor themselves. Without that underground support, big trees were bound to come down in a powerful storm, according to Jim. “A lot of the trees are growing in a tiny volume of soil. That’s why they toppled so easily,” he said. A flooded and destroyed playground in Hong Kong’s Heng Fa Chuen neighborhood is seen after the storm hit. 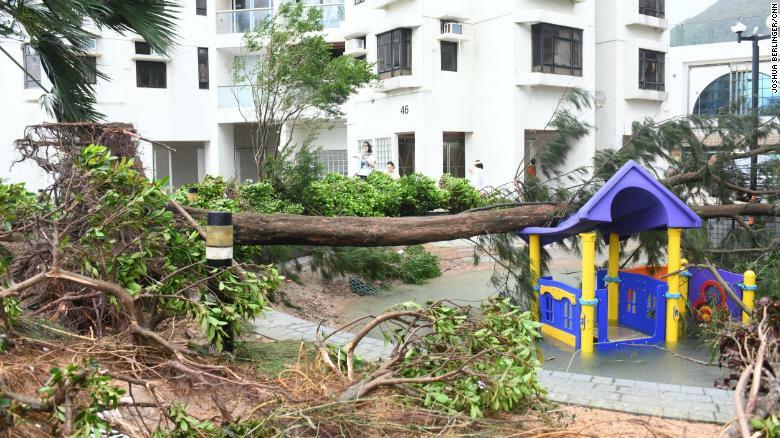 As Hong Kong had never seen a storm of Mangkhut’s magnitude, many of the weaker trees and branches were felled. But it also means areas of the city are completely denuded. Residents have reported seeing wild boars, monkeys and snakes in unusual urban areas. The working theory is that they lost their habitat in the typhoon. 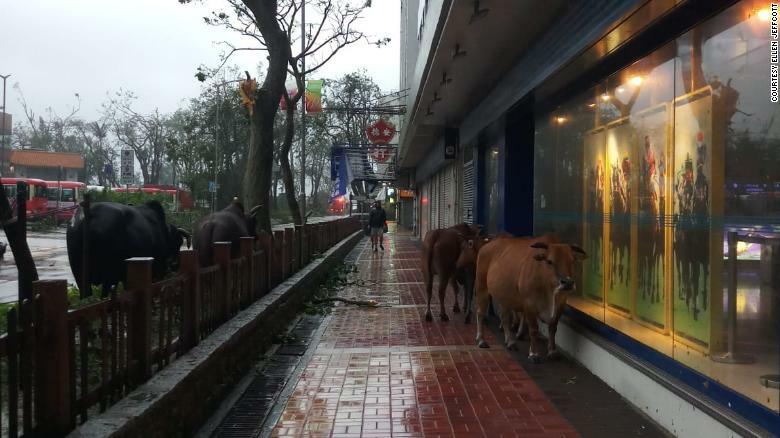 One positive is that when another storm as strong as Mangkhut comes along — something authorities in Hong Kong are worried about due to the effects of climate change — there is unlikely to be as much green waste, Jim says. Many of the trees collected by authorities in Hong Kong have made their way to the site of the former Kai Tak airport, located along Hong Kong’s Victoria Harbor. The airport was once a famous part of Hong Kong’s skyline, as planes would peek through the city’s sprawl as they approached the runway. But the airport closed 20 years ago and currently serves as a cruise terminal. Those runways are now a graveyard for Hong Kong’s fallen trees. 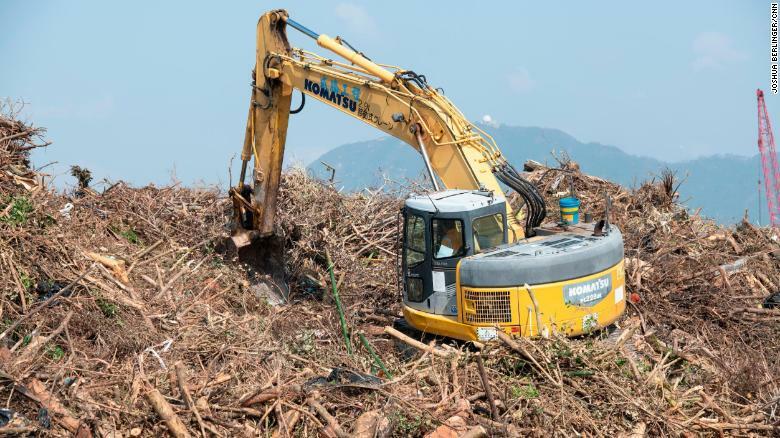 As of Thursday, about 8,000 truckloads of wood waste have been delivered there for temporary stockpiling, according to the Hong Kong Environmental Protection Department (EPD). The EPD says a “suitable portion” of the stockpile will be sent for treatment and compost and the department is exploring other means to recycle and reuse the green waste. The department says it has begun closing the site at Kai Tak. Anything that isn’t reused will probably end up in Hong Kong’s landfills, which are already saturated and were only intended to last until 2020. The EPD said 15,000 tonnes of wood waste of been delivered to a landfill as of Thursday. Critics have accused the government of mismanagement — throwing the fallen trees in a pile to bake in the sun means they are almost useless from a recycling standpoint. “The government is really good at doing concrete projects but when it comes to planting trees and managing trees, they’re just really not very good,” said Martin Williams, a nature enthusiast who runs the website HK Outdoors and the author of a book on the city’s best day walks. But the problem was insurmountable from the start, said Jim. No city is prepared to deal with 100,000 fallen trees in a matter of hours. “After the passage of the super typhoon, priority had been given to clearing fallen trees and broken branches which might cause obstruction to roads affecting traffic and pedestrians, to allow access to main roads as soon as possible, ” the EPD told CNN in an email when asked about the criticisms. The department added that it isn’t practical in an emergency situation to inspect huge quantities of fallen trees and branches and that Hong Kong lacks the capacity to recycle so much tree waste in such a short time. It also said that the moisture content of the waste made it difficult to recycle. It also said it will introduce more “diverse proposals for treating yard waste” in the future. A crane rummages through felled trees at Kai Tak. The Hong Kong Development Bureau, the government agency charged with replacing the fallen trees, plans to replenish the urban greenery using the “Right Tree, Right Place” principle — meaning it will take into account a multitude of factors when considering what to plant. While that may result in stronger, healthier trees, it also means parts of the city will look markedly different. “Some of the fallen trees might be suitable at the time of planting years ago, but having regard to the evolution of the city, re-examination of the growing environment is necessary to ensure selection of suitable and proper tree species,” the department said in a email to CNN. The Development Bureau has already started a review of the city’s urban landscape that it says it will be used in the eventual replanting plan. They are considering everything from street environment, microclimate, adjacent structures and facilities above ground and underground, planting area and soil volume. Critics like Williams and Jim worry the government is all talk, and won’t follow through on its promise to plant suitable replacement. “In the countryside, there’s some natural regeneration … but in the city, I think we might have lost some of these trees for good,” Williams said.